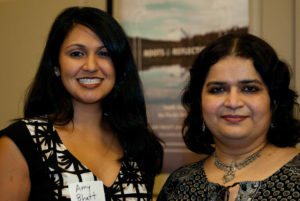 May | 2013 | Amy Bhatt, Ph.D.
On March 1, 2013, Nalini and I had the pleasure of launching Roots and Reflections at a fabulous event hosted by the University of Washington Libraries and the University of Washington Press. 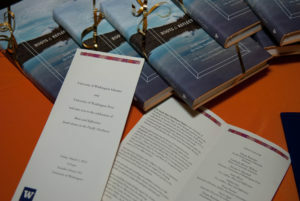 We did a reading from the book and the Libraries honored each of the narrators who participated in the South Asian Oral History Project with a copy of the book. Over 100 people attended the event! 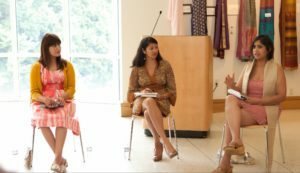 In May, I had the chance to participate in a book reading with local authors Sonora Jha and Shahana Dattagupta as part of the Aaina: South Asian Women’s Focus sponsored by Tasveer and hosted at the Seattle Asian Art Museum. We had a great turn-out and the authors dialogued around the themes of story-telling, creative and material history, and the move between various mediums of authorship. Spring semester is over and the Baltimore summer is quickly heating up. It’s been a busy few months–in April, Nalini and I gave a talk on Roots and Reflections at the University of Washington South Asia Center. During the same trip to Seattle, I organized a panel for the Association of Asian American Studies entitled “Contestations and Collaborations: Creating Asian American Archives and the Challenges of Representation” with Samip Mallick from the South Asian American Digital Archive, Neena Makhija from the Sindhi Voices Project, and Theo Gonzalves, professor of American Studies at UMBC. My paper, “From Observer to Insider to Observer: The Challenges and Possibilities of Community Based Research” explored the issues that arise when representing community histories and working with institutional and community partners who are invested in retaining historical narratives of South Asian success.